Looking for an image processor that would offer advanced options and features, yet would not cost a fortune? AVD Graphic Studio, to put it simply, is a mini Photoshop, offering very similar capabilities at a fraction of the cost. It provides over 20 tools to work with images - cropping, resizing, rotating, bump mapping, histogram equalization and many more. 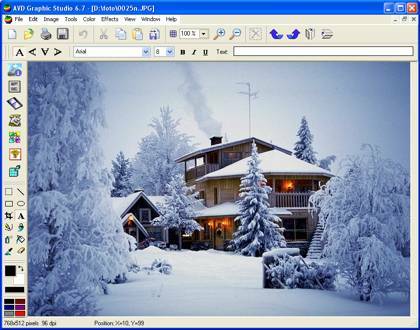 AVD Graphic Studio offers both single and batch image processing options. Try it now. While AVD Graphic Studio can be used by any amateur, who just recently purchased digital camera, the software does offer quite a few sophisticated options for professional designers and digital artists. For instance, AVD Graphic Studio acquires images from TWAIN scanners and can be used to regulate contrast, HSL, HSV/HSB and RGB settings. AVD Graphic Studio comes with four modules - MultiPage, Video, Animation and Batch Processing. The first module, as it names suggests, is show all kinds of FAX images, multipage FAX and multipage TIFF images (rev.6.0, Packbits, LZW, CCITT G.3 and G.4) with RGB, CMYK, B/W, animated GIF and Multipage PCX (DCX). Also FAX (CCITT3), G3F and G3N (Zetafax) formats supported for loading. Qweas is providing links to AVD Graphic Studio 7.1.01 as a courtesy, and makes no representations regarding AVD Graphic Studio or any other applications or any information related thereto. Any questions, complaints or claims regarding this application AVD Graphic Studio 7.1.01 must be directed to the appropriate software vendor. You may click the publisher link of AVD Graphic Studio on the top of this page to get more details about the vendor.